Seared Jamaican Pork Tenderloin gets huge flavor from a delicious marinade, a smoky sear on the grill, and a sweet & spicy glaze that caramelizes in the oven. 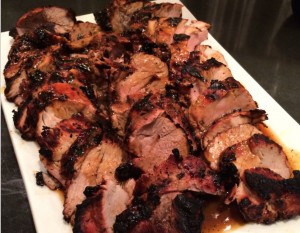 This pork tenderloin gets its name (and part of its fabulous flavor) from a unique Jamaican seasoning, Pickapeppa Sauce. A Cajun friend introduced me to this yummy sauce years ago, and now it is one of my favorite condiments. Pickapeppa Sauce is often called “Jamaican ketchup” since its origins and flavors are uniquely Jamaican. It is used as a steak sauce, a marinade, and even over cream cheese as an appetizer. It really is one product that has endless uses. Pickappeppa is a key ingredient in the marinade and the glaze for this tenderloin. Although the meat can be baked, the searing step gives it the best flavor and the rustic, seared exterior. I’ve skipped the searing step before and have always wished that I hadn’t. I serve this tenderloin with our favorite Gourmet Gruyere Cheese Grits and a good salad. For parties, I put out a platter of Callie’s Charleston Cheese & Chive Biscuits so that guests can make their own pork tender sliders. Since fruit, especially apples, pairs well with pork, I often end the meal with Skillet Apple Crisp. Please leave comments if you try this; I love hearing from my readers! Thank you so much for stopping by. Be blessed, and stay savvy!!! A flavorful marinade and a sear on the grill make this tenderloin a special treat. Heat oven to 350 degrees, and heat grill to 400 or 450 degrees. Place tenders in ziplocbag with marinade, at least 8 hours, preferably overnight. Heat grill to 400-450 degrees. Sear tenderloins on grill until grill marks are present and a crust begins to form. Remove tenders from grill, and place in small baking dish. Microwave glaze ingredients one minute; stir well. Pour glaze over tenders; place in oven. Bake until internal temperature registers at least 145. For a careamelized exterior, you may broil for a few seconds before removing from oven. Allow pork to rest at least half an hour before slicing and serving. Yay!! Happy to hear!!! FYI….you can freeze tenderloin in marinade (uncooked) and then thaw later and cook per recipe. Since tenderloins usually come two per package, this is a way to save one for future use. Thanks again for the recipe and the advice! Happy New Year! Hi Brian! I usually bake them about 30 minutes more or until the meat thermometer reads at least 160 degrees F (I don’t prefer pink). This is a rough guess; ovens vary. Let me know how yours turn out! Have a blessed 2019!!!!! Jamie, thanks for this recipe. Looking forward to trying it out. How long do you usually bake the tenderloins in the oven? Thanks!